Suri ransomware uses sophisticated techniques to infiltrate computers and hide from its victims. Use Reimage to determine whether your system is infected and prevent the loss of your files. Suri ransomware - a virus which ads the .SLAV extension to corrupted documents. Suri ransomware is a file encrypting virus which enters the system through dubious messages or rogue websites. Once activated, this type of computer infection creates dubious registry entries in the Windows Registry section which lets Suri virus to boot every time the user restarts its computer. 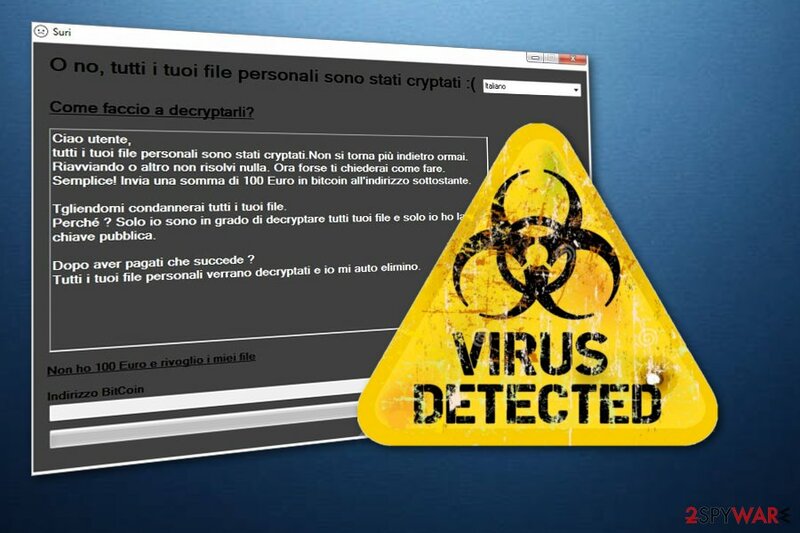 Moreover, this ransomware targets Italian-speaking users as the entire ransom note is written in the Italian language. Such message announces about files encrypted with the .SLAV extension and demands 100 euros in Bitcoin in exchange for a decryption key. After files are encrypted by Suri ransomware, they look like this: cat.jpg turns to cat.jpg.SLAV. Nevertheless, such documents become out of use. If you try to access the corrupted file, it will just run an error message and not launch. The .SLAV extension lets victims identify what kind of virus has occupied their computers. tutti i tuoi file personali sono stati cryptali. Non si torna più indietro ormai. Riavviando o altro non risolvi nulla. Ora forse ti chiederai come fare. Semplice! Invia una somma di 100 Euro in bitcoin all’indirizzo sottostante. Tgliendomi condannerai tutti i tuoi file. Dopo aver pagati che succede ? Tutti i tuoi file personali verrano decryptati e io mi auto elimino. We advise not to fall for fake crook's promises and avoid contact with them. More importantly, DO NOT pay the demanded ransom. You are very likely to be scammed and face money losses. As another option, we suggest performing the Suri ransomware removal with a trustworthy anti-malware tool. This needs to be done as soon as possible to avoid further damaging consequences. Another reason to remove Suri virus is that this ransomware-type cyber threat might have the ability to perform hazardous actions in the background which might open the path for other malware forms such as Trojans. Be aware that if your computer gets infected with other viruses, it can become harder to get rid of all of them. You can fix the damage done by the ransomware with the help of Reimage. 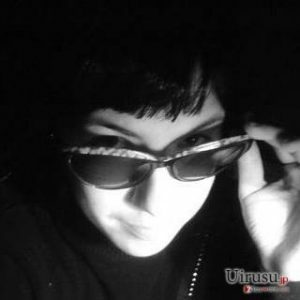 Suri ransomware - a file locking threat which targets Italian speakers. According to malware experts' team from LesVirus.fr, ransomware is a very dangerous malware form that affects numerous users worldwide. Most commonly, such viruses are distributed through phishing messages which come with hazardous payload in a form of an attachment or hyperlink. If you ever receive a spam email and you are not currently waiting for anything important to receive, make sure you get rid of all suspicious-looking messages. Moreover, you can get infected with ransomware if you are very likely to visit rogue websites. Our own careless actions cause such harmful infiltration. Try to stay away from questionable pages that are promoted by third-parties as you can never know were hazardous content can be hidden. Additionally, installing trustworthy antivirus protection is also strongly recommendable. If you have spotted some ransomware-related symptoms and are wondering, how to remove Suri virus from your computer system, we have a solution for you. What you need to do is download and install reliable anti-malware software that will help you to deal with the dangerous infection. Such security tools will take care of the cyber threat and all virus-related components that might be secretly hiding. After you complete the Suri ransomware removal, you should perform system backups to make sure that the ransomware was deactivated successfully. Moreover, now you can start thinking about techniques which might help you restore corrupted files. Check out our suggested methods which you can find below the text. Log in to your infected account and start the browser. Download Reimage or other legitimate anti-spyware program. Update it before a full system scan and remove malicious files that belong to your ransomware and complete Suri removal. When a new window shows up, click Next and select your restore point that is prior the infiltration of Suri. After doing that, click Next. Once you restore your system to a previous date, download and scan your computer with Reimage and make sure that Suri removal is performed successfully. Guide which is presented above is supposed to help you remove Suri from your computer. To recover your encrypted files, we recommend using a detailed guide prepared by 2-spyware.com security experts. Data recovery can be hard to achieve but definitely worth a try and a better option than paying the crooks. You can see some file restoring methods below. Choose the most suitable-looking one for you and complete each step with big care. Use this third-party software if wanted to restore important documents that were corrupted by the ransomware infection. If you decide to use this method, make sure you activated the System Restore feature before the virus infiltrated your computer system. Note that, if wanting for this method to work, Shadow Volume Copies of corrupted documents should not be erased, otherwise, Shadow Explorer might seem useless. If so, try another method. No official Suri ransomware decryptor has been released recently. ^ What Is Bitcoin?. Bitcoin magazine. All about cryptocurrency. ^ LesVirus.fr. LesVirus. IT tips and computer protection. This entry was posted on 2018-09-10 at 03:54 and is filed under Ransomware, Viruses. You can quickly scan the QR code with your mobile device and have Suri ransomware manual removal instructions right in your pocket. How did you remove Suri virus?